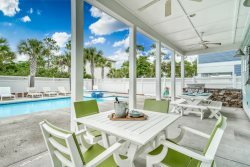 Nestled in the quiet community of Magnolia Cottages of Seacrest, The Copper Fish is a beautifully decorated 4 bedroom 4.5 bath home, perfect for your next beach escape. With plenty of porches to relax on and the open concept living area, this cottage offers exactly what you and your family or friends want for your beach vacation. The main level of the home features the living, dining, and kitchen area plus a queen master bedroom with private en-suite. Family and friends can spread out in this cozy yet spacious area to spend quality time together. Watch a show on the flat screen TV, enjoy meal at the dining table that was prepared in the open, well-stocked kitchen, or use the large dining table to play some fun board games. A half bath is located on this level too. Head upstairs where you will find 3 more bedrooms all with private baths. The king master bedroom has the unique feature of a private outdoor shower just off the en-suite. No worries, there is an indoor shower as well, along with an extra long vanity. The queen guest room has a flat screen TV and the private bath has a walk in shower. Also on this level is the bunk room, with 2 sets of twin over twin bunks, both with twin trundles. The room sleeps up to 6 and is a great space for the kids. They will enjoy hanging out in the bean bag chairs and watching the flat screen TV. Grab a bike (4 free bikes provided) and head down to Alys, Seacrest, or Rosemary Beach to enjoy shopping and dining. Head west to the Hub 30A for more goods and shops. The beach and zero entry community pool are close by. You will love the Magnolia Cottages quiet community and the upscale, designer decor of The Copper Fish. 4) Construction is all along 30A. We cannot be held responsible for construction near the home. 5) There is construction going on across from the home as well as other parts of the neighborhood.